Welcome to the Professional Development Hours (PDH) Training Status Page. Please Login or Join to save your data to the site and have access to it from everywhere. Training Status Page. Shows users a summary of their training status for all licenses in an easy to read format. Logged in users can access this screen by clicking on the "Training Status" menu link at the top of the web page, or by clicking on the colored license status boxes on the left side of the site home page just below your username. Users can click on a license or certificate name and it will jump them to a more detailed view of that license and its status. 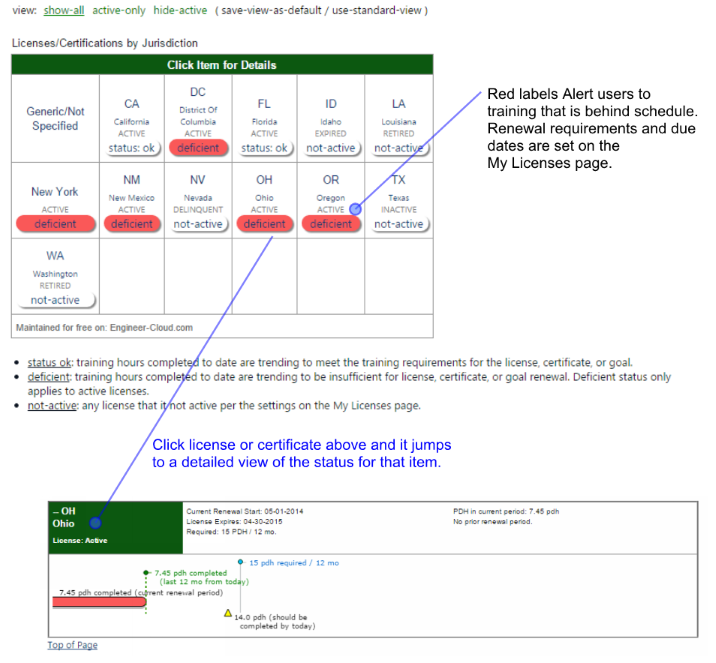 Red indicators are provided to show where training is falling behind where it should be based on the license or certificate renewal schedule or the users entered training goals. Links at the top of the page allow the users to view all licenses in the system, only the active licenses if they wish to only see licenses that are active, or the licenses that are not active. Users can save this selection as their default view using the links provided. A screen clip of this new page is below.